CHILDREN WANT TO SAVE THE WORLD – Primetime Media Ltd. Working with children from Boston’s Blackfriars Art Centre, Joanna White from Primetime filmed and animated a short call-to-action video – the content of which was directed by the young people themselves. As part of this public engagement project, Joanna compiled data surrounding world food sustainability and presented it to the bright young actors at a one day think-tank. She was led by their ideas and enthusiasm, allowing their acting and improvisational skills to dictate the direction of the finished edit. 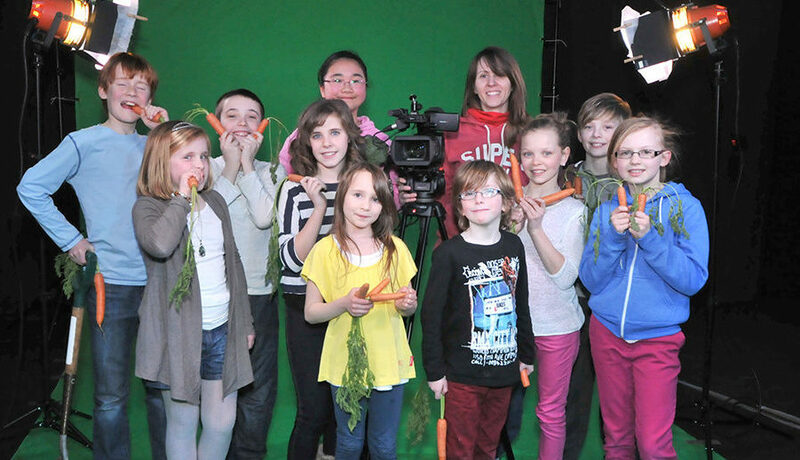 Joanna added: “The children were a delight to work with, very responsible in the green screen environment and were genuinely funny and productive. I’m very grateful to Blackfriars for the use of their stage to record the green screen scenes with the children, and to the Sam Scorer Gallery in Lincoln which formed the (albeit digitally enhanced) backdrop to the children’s green screen acting”. Finally, to produce a number of talking posters (voiced by Alison Harris) she used specialist face morphing software and Adobe After Effects to bring all the elements together for this intricate two and a half minute production which was recently exhibited at Black Friars during their Food For Thought exhibition.